Lanterns and flags decorate the electronics town, while people dressed up in kimonos dance to the festival music and drums. A display resembling a mikoshi is carried around throughout the city. The atmosphere seems as if a whole matsuri, a Japanese festival, has arrived at a local city in Asia. 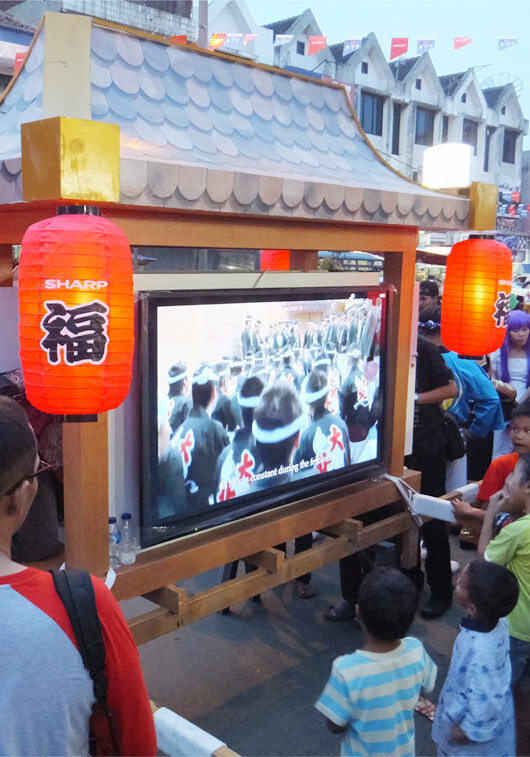 This is a scene of Sharp's sales promotion activity "MATSURI" in the ASEAN region. How can we get our activites to lead to the satisfaction and joy of our customers? How can we get the whole region involved, not just by ourselves, but in collaboration with local electronics stores? This is one solution we have reached based on know-how we have accumulated step by step over the years. 50 years ago, Sharp established a marketing force called "ATOM" (Attack Team of Market) in Japan. Inheriting its sales methods cultivated over the years, Sharp newly established its Asia ATOM Control Department in July 2014, which conducts personnel training, sales techniques, and proposing store exhibits. Sharp will continue to search for the optimium sales activities in the region, represented by such activities, and getting stores and the whole city involved. There is a blue bus running around the country of Indonesia. When the bus arrives at a city, people gather around, bringing Sharp products from their houses. The bus opens, revealing new products on display. Sharp has as many as 366 service centers in Indonesia (as of January 2014), but considering that the country consists of over 13,000 islands, a service network to cover the entire the country is a concurrent issue. This is why Sharp came up with the "service bus" concept to serve areas where there are no service bases and provide repair service to the people in such regions. "What is really needed in that region?" We reached the answer to this question after carrying out many long reaearch studies. The blue service bus may be heading for its next destination at this moment right now. Just importing Japanese styles and ideas is insufficient to grasp the actual demands in each region. Just creating products similar to those already existing in the market will not lead to creating new values. The challenge at Sharp is how to provide products and services to meet various demands, based on the technologies and products we have already cultivated. For example, when people watch TV in Indonesia, they enjoy the powerful sound as well as the beautiful picture. In order to meet such demands, Sharp created the "IIOTO AQUOS" series combining a sound system with its featured high resolution LCD display. Other locally adaptive products are also available. Our air purifier with "Haze Mode" is another product based on our featured technology, plasmacluster ions, adding a new value to react swiftly against dust and smog particles. This product is introduced in various markets, including Singapore and Malayasia. This ice pack has been developed by Sharp's R&D Unit so that it does not need to be frozen for use. 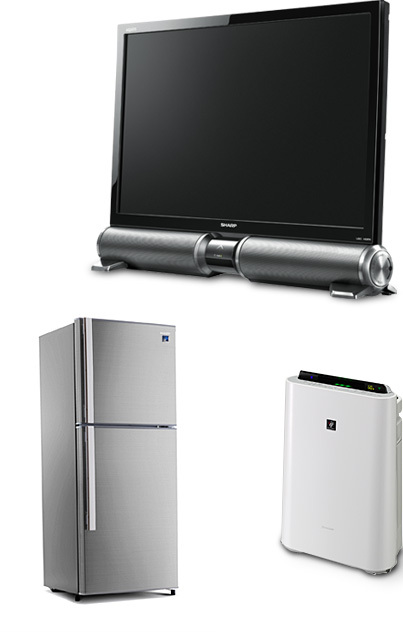 The refrigerator announced for the Indonesian market in July 2014 features a new ice pack developed by Sharp that freezes in the refrigerator. Even in a power outage, the ice pack keeps the food and drinks stored under cool conditions. Sharp is a company with a Business Philosophy that states,"We are dedicated to the use of our unique, innovative technology to contribute to the culture, benefits and welfare of people throughout the world." Yes, Sharp will continue meeting its challenges.